Walking Football is a Football at a different pace. Running is not allowed. Aimed at keeping the older generation actively involved in the game, Walking Football is becoming more and more popular all over the world. 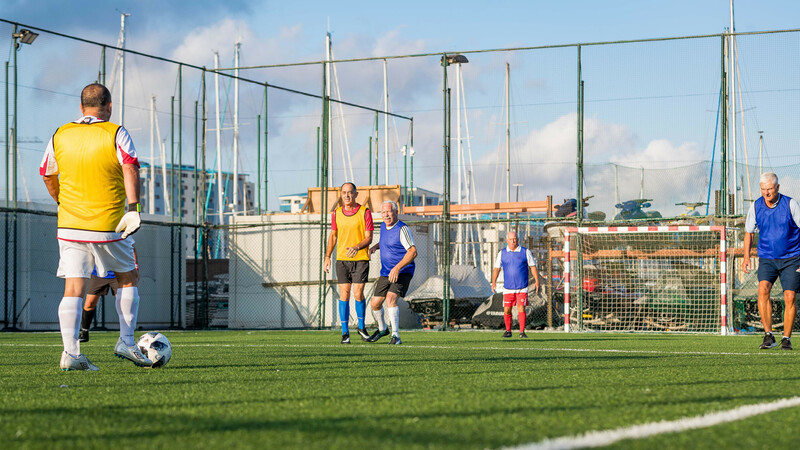 Walking Football sessions are held in Gibraltar on Wendesdays and Fridays at the Victoria Stadium Sports Complex. Gibraltar's Walking Footballers took part in their 1st ever tournament in Bristol, England, where they competed in the over 65's International Super Masters Tournament taking on teams from Scotland, Holland, Canada, England & Wales. They kicked off the tournament with a 2-0 defeat to Ayr United FC from Scotland. Next up was Holland Over 65's with some foamer Dutch internationals on show. Gibraltar lost 3-0 to their Orange opposition. A 1-0 win over Wales followed with a goal from Eliot Federico. In their 4th game they drew 1-1 against Inter UBC Veterans from Canada with a goal scored by Clive Beltran. Finally they drew 0-0 against Birmingham Walking Football Club from England. Overall Gibraltar finished the tournament in 4th place. A very creditable finish given the caliber of the opposition they were up against and the fact that this is the first tournament of its kind that they take part in. The overall impression they gave was amazing, so much so that Gibraltar were awarded the fair play award at the end of the tournament.